I love shortbread. It is so easy and so satisfying. I grew up making a basic butter-flour-sugar version. It was simple and the ingredients were always on hand. Lately I have been into trying new varieties of shortbreads. One of my favorites has been the oatmeal-pecan shortbread. I even made it at the holidays and added a chocolate garnish to pretty it up. As I was cleaning out a drawer a few days ago, I found a clipping for a recipe for lemon-cornmeal shortbread. The lemon-cornmeal shortbread seemed like a nice choice. And, as it turns out, it was quite popular. People asked for the recipe... Nice! With the rack set in the middle spot, preheat the oven to 325. Lightly grease a 9x13-inch pan. Line the bottom of the pan with parchment paper. This will make getting the cookies out so much easier. In a medium bowl stir together flour, cornmeal and salt. In a larger bowl, mix butter, sugar, lemon zest, lemon extract and vanilla extract with electric mixer on medium-high, until creamy, about 4 minutes. Add the flour-cornmeal mixture and beat on low speed until it forms moist clumps. Turn dough out of bowl into the prepared pan. Using a floured rubber spatula or floured fingertips, spread the dough evenly in the bottom of the pan. I used my fingers at first, adding more flour to them as needed to keep from sticking, to get the dough spread out. Then I used a floured rubber spatula to smooth it out more. Bake until the top is golden brown and dry-looking, about 40 minutes. Remove pan from the oven and immediately cut into pieces. 1-inch by about 2-inch bars are good. I cut mine into 1 by 1-inch squares to get more pieces, cutting off any edges to get nice, clean squares. You want to CUT THEM IMMEDIATELY. If you wait until they cool, the shortbread is too dry and will crumble. Let the shortbread cool in the pan completely, then use a small metal spatula or knife to carefully remove the pieces from the pan. Note: The dough can be made ahead, spread in the pan and frozen for up to a month before thawing and cooking. Baked shortbread keeps for about three days, kept well-wrapped at room temperature. 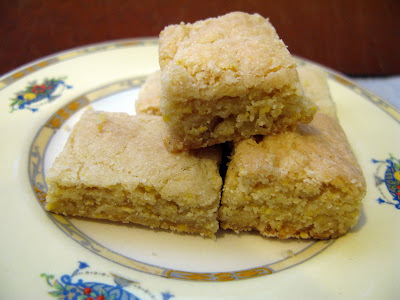 The result: Crumbly shortbread with a light lemony flavor. 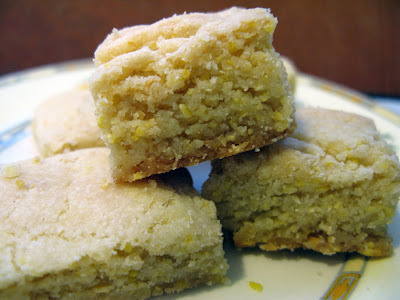 The medium cornmeal gave the shortbread a distinctive crunch that I liked, but MF found a little odd and unexpected. For this reason, I would recommend getting a finely ground cornmeal if possible. 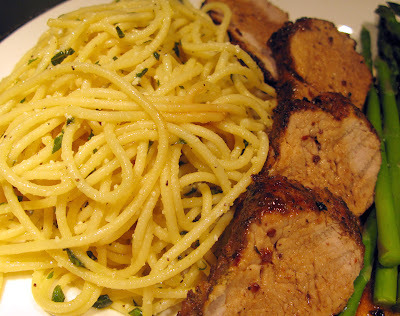 I was looking for a tasty side dish to pair with pan-roasted pork tenderloin and came across a recipe in "Everyday Italian" by Giada DeLaurentis. The combination of lemon and Parmesan cheese sounded like it would be a nice compliment to the meat and a simple side of steamed asparagus. After reading the recipe, I decided (of course) to make a couple of my own modifications. So, here is my version, with a little more cheese than she called for and with some garlic that she did not call for. Meanwhile, whisk together olive oil, Parmesan, lemon juice and garlic. Salt and pepper to taste. Once pasta is cooked, reserve 1/2 cup of cooking liquid, then drain pasta. Toss pasta with lemon sauce, basil and lemon zest. If you want the pasta to be saucier, toss in reserved pasta water, 1/4 cup at a time to get desired consistency. This was a great side for my roasted pork. The lemon gave it nice little zing and the garlic I added gave it more of the bite I was hoping for. I think this would be good on its own as a simple dinner with a salad. It also seems like it would pair well with grilled shrimp or fish. Since my fish options are limited these days, I am trying to find new and different (and easy) ways to make chicken. This was a very easy, very tasty option. I started the chicken marinating the night before, so it got close to a full 24 hours in the marinade. As I was making Tuesday's dinner, I just whipped up the marinade for this and got a head start on Wednesday's meal. The herb puree-marinade made a nice crust on the chicken when it was grilled, and the herb-yogurt sauce was a cool and tangy contrast. Season chicken pieces with salt and pepper. Puree the parsley, basil, garlic, salt and cayenne until it is a paste. Blend in olive oil until it is smooth. Set aside half the herb mixture. Using the other half of the herb mixture, set the chicken to marinate. Cover and refrigerate. The chicken can be marinated for up to 24 hours. Get your grill ready... I used a gas grill set on high to preheat it, then lowered to medium before I put the chicken on to cook. Cook chicken 7-10 minutes, turning halfway through, until firm to the touch. Once the chicken is done, remove it from the grill and let rest 10 minutes. 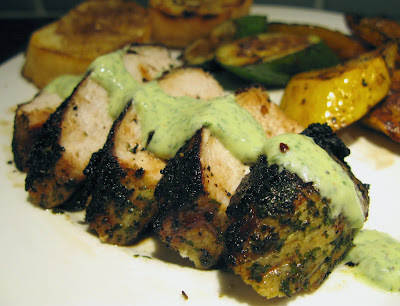 While chicken is resting (or in my case, the night before) mix the yogurt with the herb puree that you had set aside. Sauce will be fine in the fridge overnight. I made some grilled yellow squash, zucchini and orange peppers with this. I gave the veggies a quick dip in some olive oil and balsamic vinegar before grilling. For a carb, I brushed some baguette slices with the oil and vinegar and grilled those on each side. It was a flavorful meal, but still fairly light. And it was sooooo easy. I saw a version of this ages ago in Sunset magazine and ripped the page out just based on the picture. It took me a while, but I finally got around to making it this weekend. After reading through the recipe, I decided it was not chocolatey enough. So I basically doubled the amount for the chocolate layer. It was perfect. My taste testers had no complaints about the extra chocolate! Preheat oven to 350°. In a food processor, pulse almonds and granulated sugar until finely ground, but NOT until they turn into nut butter. Add flour and salt and pulse to blend. Add butter and pulse until mixture resembles coarse cornmeal. With motor running, add egg, egg yolk, and almond extract and whirl until dough comes together. Evenly press dough into the bottom (not the sides) of a 10-in. tart pan with removable rim. Bake about 25-30 minutes, until golden brown. Let cool to room temperature, then remove rim. To get the base of the tart pan off, I waited until it had cooled some, then carefully slid a butter knife between the base and the crust to loosen it. Be careful not to crack or break the crust. The crust can be made a day or two ahead and stored in an airtight container or wrapped in plastic. In a the bottom of double boiler, bring water to boil. Reduce heat to medium. Put chocolate in the top of the double boiler and stir until melted. Stir in 4 tbsp. cream, stirring constantly to blend. In a large bowl, beat remaining 1/2 cup cream to firm peaks. Beat in mascarpone or cream cheese, powdered sugar and vanilla. 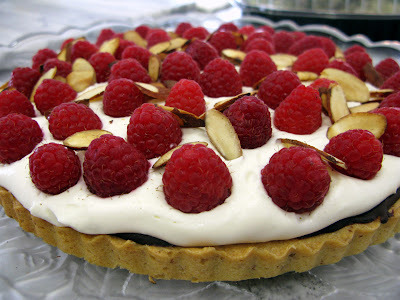 Serve tart immediately or cover with plastic wrap and chill up to overnight. So I obviously have been absent from the food blog for a while. If you read the other blog you know why: I am knocked up! It has taken me a while to get my appetite back for anything other than cereal or cheese and crackers. Not to mention not having the energy to do any cooking. But I am into the second trimester and the appetite and energy are returning. So I hope to try some new recipes and post here more. Up now... I think it is clear that I am fond of certain Asian flavors. I use sesame oil and rice vinegar and Sriracha chile sauce in a lot of things. A favorite way to use them is in a light slaw that is great with grilled meats (or even on its own!). 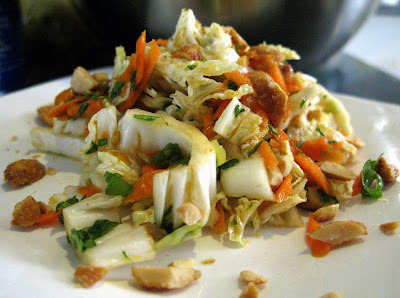 Toss cabbage, cilantro, carrot, green onion and peanuts in a large bowl. Whisk together sesame oil, rice wine vinegar, brown sugar, ground ginger and Sriracha. Add dressing to cabbage mixture and gently combine to coat. 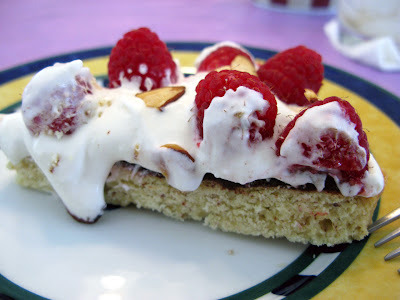 I found this recipe on Smitten Kitchen (great cooking site, by the way). I was hoping to find a chocolate dessert for Easter to contrast the walnut-pear cake that I love. I was thinking cake or pie or tart. Instead I found this. And it was just what I wanted. 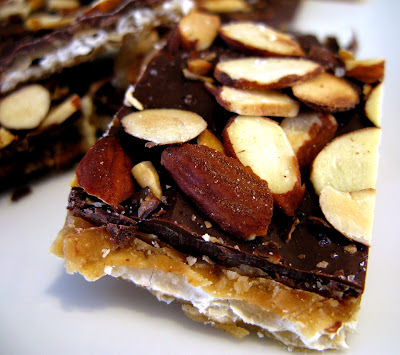 Chocolate caramel crackers, co-opted from Smitten Kitchen. Apparently this is not a new recipe. But it was new for me, so I give credit where it was due. I am not even going to post the recipe here, just my own picture and the link, above. Go there. Make it. Get addicted. This came to me in a moment of laziness. I was ready to make dinner Monday night, but did not have the gumption to get myself to the market. A quick tour of the pantry yielded a box of cous cous. In the freezer I found some precooked soybeans in the pods and a pork tenderloin. Yeah, I can work with these. I set the pork to thaw in a sink full of cool water then got to thinking about how to make it all work together. My inspiration was two yummy salad options from the Corner Bakery. At my branch of this chain they have an option of getting a trio sampler of some of the salads. Two that I really like are the ginger and asparagus cous cous with dried cranberries and almonds, as well as a mixture of edamame with asparagus and tomatoes in a tangy Asian-inspired dressing. 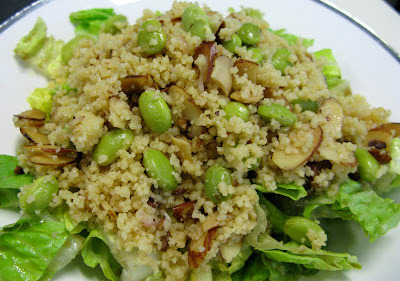 Somehow toward the end of my meal they are commingling on the plate so that I get cous cous and edamame together. Which is fine. It tastes pretty good. So I decided to take what I liked about those salads and combine them, being limited to what I had at home. Pour dressing over cous cous mixture and gently stir or toss to coat. If there had been a red pepper in the fridge, I would have diced some of that up and added it for a little more color and flavor. But this was pretty good as is. I served this on a bed of chopped romaine lettuce. To make it more of a dinner for the manfriend and me, I added some slices of grilled pork tenderloin. Since the cous cous dressing had some tang and spice to it already, I kept the meat simple, just marinating it in a mixture of 1/2 cup soy sauce, 1/2 cup brown sugar and 2 tbsp sesame oil. This was awesome. I like a combination of cool and hot like this. And the lettuce underneath gave it an extra layer of crunch. I had leftover cous cous over more lettuce for lunch today. Still good. And so, so, so easy to make. Cravings are funny things. Where do they come from? Why one thing and not another? I get cravings a lot. Popcorn, chocolate, steak, cheese. They just pop up for no particular reason. But my recent craving for scallops... That I can blame on "Top Chef." They have been cooking a lot of scallops on that show this season. "It'sa notta 'Toppa Scallopsa!' It'sa 'Toppa Chefa!" according to contestant Fabio. So when I was planning dinner yesterday, I decided to give in to the craving and make a scallop appetizer. Heat oil in a large nonstick saute pan over medium-high heat. Lightly salt and pepper the scallops on both sides. Add scallops to pan. To get a good sear and good color on them, do not move the scallops. After about 2 minutes, turn the scallops over and let the other side sear about 2 minutes. Remove scallops from pan and place in a covered bowl to keep them warm. Turn heat down to medium and add butter to melt. Add shallots and garlic; saute 1 minute. Add wine and lemon juice, cooking 1-2 minutes until liquid reduces by about half. Return the scallops to the pan and turn to coat with the sauce. Divide arugula among four plates. Put two scallops on each plate. 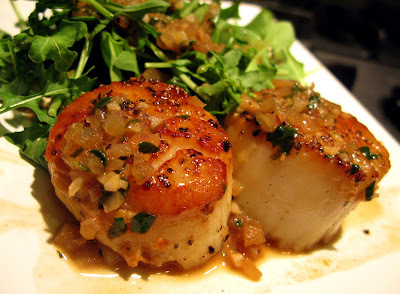 Drizzle sauce over scallops and arugula. The flavors were all perfectly balanced: just enough lemon, just enough garlic. And the shallots were sweet and not too strong of an onion flavor. I thought about using mixed baby salad greens, but went with baby arugula for its slight peppery flavor and the fact that it does well when wilted a bit by the warm sauce. It probably would also make a very nice main dish to make extra sauce and a couple more scallops each and serve it all, including the arugula, over a bed of angel hair pasta. I have made scallops before, but this is the best preparation I have tried as far as ease and taste go. I love soups of all sorts. And when I take the time to make soup, I usually make a big pot so I can have leftovers. Then I put those leftovers in single serving portions in zip-top bags and put them in the freezer. My trick for this is to freeze the bags flat. Then once they are frozen, I can stand them up or stack them or whatever. It makes them easier to fit in the freezer than misshapen frozen lumps in bags and seems to take less space than using several small bowls. You can see what I mean HERE. The picture was from a cooking frenzy last year about this time. 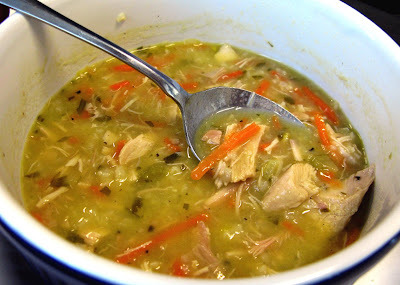 So, to get back on track, my soup project this time was chicken and rice with veggies and a hint of lemon. I have made the chicken soup from scratch in the past, starting with the chicken and roasting it and cooking down the bones for stock. So much work. These days, I love a good shortcut. So I used a cooked chicken from Whole Foods. It was a smoked chicken, so it gave the soup an extra layer of flavor, though a regular roasted or rotisserie chicken also works well. I also used pre-shredded carrots from Trader Joe's and the low-fat, low-sodium chicken broth from Trader Joe's. Oh, and in most of these recipes, when I say salt, I am using a fine-flake sea salt or kosher salt. And pepper is fresh ground black pepper. Heat oil or butter in a large stock pot over medium-high heat, adding onion, carrots and celery. Add dash of salt and a couple grinds of pepper. Cook with lid on for about 5 minutes until veggies soften, stirring and making sure they are cooking, but not really browning. Add wine and cook another 5 minutes. Add broth, chicken and lemon juice and cook until hot. Add cilantro and arborio rice plus salt and pepper to taste. Cook 20-30 minutes or until rice is done. So I like lemon. A lot. I tried to temper that and make sure this soup was not too lemony. I think 4 tbsp is a good amount of lemon juice. But if you are not so big on the lemon, add 2 tbsp, taste it and add more until it has the amount of lemon that you like. I also really like cilantro, but I know some people don't. This would work well with Italian parsley as a substitute. Same with the rice. I had arborio, which is normally used in risotto. So I used arborio. Pretty much any rice would do. But I tend to like a sturdier rice like arborio. I think it stands up better to being cooked, frozen and reheated. Or use some orzo pasta. I like to cook the rice right in the soup instead of cooking it separately and adding it later because the starch in the rice helps thicken the broth a little. 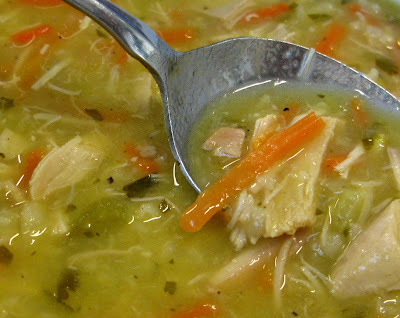 So you end up with a brothy soup that is not thin. And it is packed with stuff. Every bite has chicken and veggies. Oh, and I got nine 1.5 cup servings out of this.